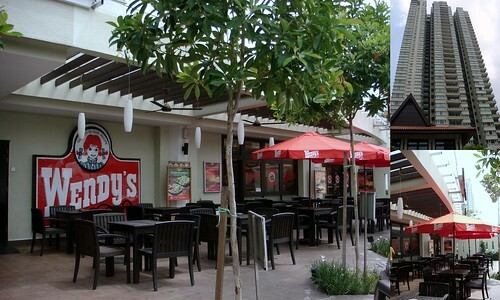 I have to say… I’ve never been a huge fan of the Wendy’s here in KL, but stepping into the Mont Kiara Banyan Walk branch (very near Solaris), I am a convert! I still think it pretty much depends on the turnover of the branch, but the meat patties here, at Mont Kiara’s Wendy’s, are pretty decent. I could actually taste the beefy succulence of the burger this time. 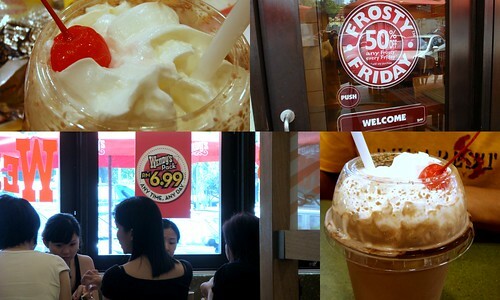 At RM2.99 for a frosty/milkshake, it’s really a steal on Fridays. The parking is easy and the place has a laid-back, breezy feel to it. It gets rather packed during Friday lunch hour, but still enough place to sit around and enjoy your burger meal. me thinks their burgers cannot lah …. dry and tasteless. but the frosty's good. the baked jacket potato sometimes ok, sometimes not. I miss Wendy's!!! Hardly to find it here in Jakarta… or they are really got closed down, hmmmm…..
same as Sean, alws for Carls if it is fast food burgers.. So far Wendy aint wow-ed me yet..BUT like u said..mayb Mt Kiara = classier burgers!